I heard your call and wish to communicate with you. Are you here to speak to me? We normally vibrate in the sixth and seventh dimensions, but we are able to take on a form in the fourth dimension to assist Earth. However, the 4D ethers are very polluted with the thoughts, feelings, and chemicals of many eons of third dimensional living. It is our service to assist in the purification of this dimension around your planet. Many inhabitants of your planet will be shifting into their astral bodies, which vibrate to their fourth dimensional resonance. We are sorry to say that in your time frame, the conditions in the fourth dimension are not very much improved over your Earth’s third dimensional life, as the Orion laggards are working against us at every turn. Fortunately, they are no threat to us, as they have so lowered their density that they cannot expand themselves above the fourth density. Hence, we can easily raise our vibration and that of our entire ship if ever there is a danger of confrontation. It is not our intention to create a war zone in fourth dimension dimension, as many humans on Earth have done. We do not mean to sound negative. Actually, all is going as planned, as both the light and the dark are now shifting into a higher frequency. More and more, we are able to communicate with earthlings, some humans and some animals, that are able to ground our message and distribute it to others. Those who are consciously aware of our presence serve to step-down and anchor our energy into the very body of Lady Gaia. Thank you for your service. People who are becoming more conscious of their ability to transform their lives and their environment are preparing to vibrate to the fourth density. We hope to assist those who are NOW able to hear us by expanding their mental ability to consciously accept information that once threatened their worldview. You came into my meditation today. Is there something you wish to tell me? Yes, we have come to your planet to assist during this time of need. Many Antarians have chosen to serve Earth from the fourth dimension, as we cannot tolerate the low vibration of your third dimensional world. We also hope to make contact with those wearing earth vessels who have lived incarnations on our world. Take a moment now to remember your life or lives on Antares, as it is important that you remember it in your present time. I am Illia Em, an Arcturian Elohim. I have come into this meditation because I could feel that you were having a difficult time remembering your Antarian life. This, my dear, is because you have not yet come to terms with the warrior inside of you. There has been so much violence in your time that you have come to associate a warrior with one who is violent. This is not true. A warrior is one who is able hold onto a concept and/or duty and be true to it in the most difficult of situations. Many of you have been this type of warrior in other incarnations. Now return to Commander Maltese. He will guide you in your journey to Antares. Commander Maltese here. We thank you dear Elohim, Illia Em. We will now take you on a journey into your deepest memory of when you were on Antares. See the high gray peeks and the bright yellow dawn. You can see the violet glow of the Sun as it climbs above the peaks of the high mountains and gradually sets its light on your meditating form. In the reality that you are now viewing, you were a Shakamore, which is a High Priest. Feel how you are impervious to all weather. Weather is, of course, quite different in our world as the dimension makes it so that the weather is a primarily a reflection of your personal state of consciousness. However, when you become a Shakamore you do not create weather at all. You are in the midst of a calm bubble of peace and many wish to be with you in order to enjoy the peace that you radiate. There is another flame that is to be guarded now. This is the Flame of Truth. The Truth is being sent into the hearts and minds of all who are able to receive it at this “time.” Groups of three will again be pivotal in the transmission of this Truth. Be patient, as the Work will present itself. I felt your presence and wonder if you wish to speak to me. Yes, we do have a message for you. We wish at this time to share with you the meaning and reason for our communications. We are indeed a higher vibration of your many selves and at the same time we are what you would think of as a “separate entity.” Our consciousness is far more complex than your third dimensional mind can even imagine. One of the purposes for our communications is so to assist you to increasingly open your mind to your fourth and fifth dimensional way of thinking. We can assist you in this endeavor because we are of the same vibratory thread. A “vibratory thread” is the consciousness, energy and light that connects your third dimensional physical form to our fourth dimensional Astral Body and our fifth dimensional Lightbody, as well as to our sixth dimensional Light Being and our seventh dimensional Oversoul. This vibratory tread also extends into our eighth through tenth dimensional Solar Elohim and our eleventh through twelfth dimensional Stellar Elohim. Of course, in the sixth dimension and beyond, all form is fleeting and beings are encased in multidimensional light consciousness that travel throughout all reality. Many vibratory threads arise from the Solar Elohim (creator and protector of a solar system) and even more vibratory threads arise from the Stellar Elohim (creator and protector of a galaxy). The Elohim are the creators and holders of form. Hence, they send down the Divine Quality of “consciousness encased in form” into the lower worlds where it can become materialized. When people “channel,” they are actually channeling a ONE who is of the same vibrational thread coming from their Lightbody, their Oversoul, their Solar Elohim and/or their Stellar Elohim. One can also channel a member of the Angelic Kingdom and/or an Ascended Master to whom they are connected via their vibratory thread. All of you who channel serve with us in the forces of the Galactic Council and report to your Ship or higher dimensional station while your earth form sleeps. You visited us last night in your Lightbody, which is why you felt our call this morning. Because you often wear your Lightbody when you visit us, you are beginning to remember that sensation in your earthly life. However, you mostly remember it while eating food. Your Lightbody ingests light and does not ingest food. The physical part of you thinks that you need to eat, but the higher dimensional component of you does not. Hence there are many inner conflicts about eating that you do not currently understand. The portion of you that is awakening to your Lightbody has great difficulty ingesting third dimensional food, but your physical self still requires it. You are being trained to accept less physical food into your body so that you can learn to ingest more light and activate an ongoing conscious connection to your Lightbody. This activation of youy Lightbody allows your fourth dimensional astral body and your third dimensional physical body to connect your vibratory thread to Gaia. This connection allows the vibration of your third dimensional surroundings to be expanded into the fourth dimension. Eventually, the fourth will then be raised into the fifth dimension. As more and more light-workers make this contribution of connecting their vibratory thread to Earth’s energy field, it will greatly assists Gaia’s transmutation into Her planetary Lightbody. When you remember to merge your consciousness with Gaia, you assist Her, as She assists you. 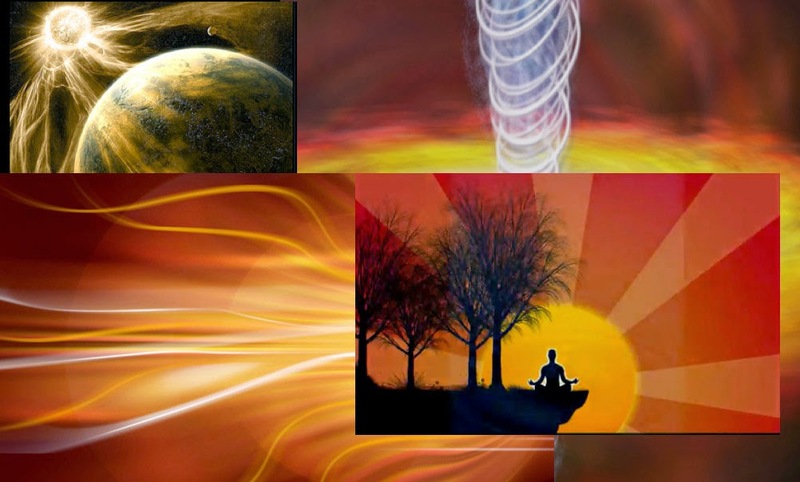 This form of personal and planetary connection will greatly facility both personal and planetary ascension. Antares is a red supergiant star in the Milky Way and the sixteenth brightest star in the nighttime sky. It is sometimes listed as 15th brightest, depending on how the two brighter components of the Capella quadruple star system are counted. Antares is the brightest star in the constellation Scorpous, and is often referred to as "the heart of the scorpion". Scorpius is one of the few constellations that looks like its namesake. The bright red star Antares marks the “Scorpion’s Heart.” Notice also the two stars at the tip of the Scorpion’s Tail. They are known as “The Stinger.” Antares is located in the southern half of Earth’s sky. So your chance of seeing this star on any given night increases as you go farther southward on Earth’s globe. 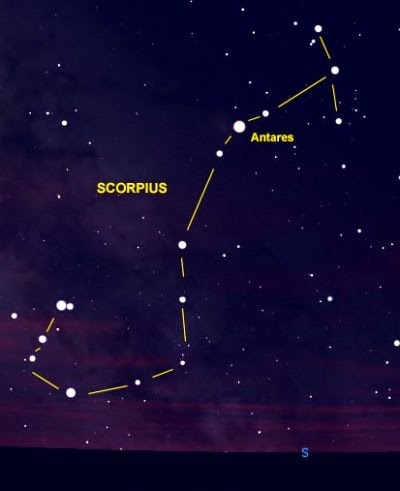 If you traveled to the southern hemisphere – from about 67 degrees south latitude – you’d find that Antares is circumpolar, meaning that it never sets and is visible every night of the year from Earth’s southernmost regions. Antares is 550 light years from Earth and the brightest star in the constellation of Scorpio. If Antares replaced the Sun in our solar system, its orbit would extend beyond the orbit of the fourth planet, Mars. Antares is a two star system consisting of the red supergiant Antares A and the much smaller but hotter Antares B. Antares B is ten times more massive than our sun and around 150 times brighter, but as a result of it being dwarfed by the massive Antares A it cannot be viewed without the aid of a telescope. Antares is around 10,000 times brighter than the Sun. Massive stars such as Antares burn their fuel extremely quickly. Thus, they only exist for a few million years. At only around 12 million years old Antares is already nearing the end of its lifespan and is expected to explode as a supernova in the next million years. Low mass stars such as our sun exist in their main sequence for several billion years. Due to is reddish color, Ancient Greeks associated Antares with the planet Mars. I fact, the name Antares is Greek for "rival of Mars." Along with Alderbaren, Regulus and Fomalhaut, Antares comprises the group known as the 'Royal stars of Persia'. At one time these four stars marked the two Equinoxes and two Solstices. These four stars have also been characterized as Horses, reflected both in the famed Four Horsemen of Apocalypse (Revelations 6) and Chariot Horses in the Book of Zechariah. Some say that Antares was Antar's Star, and referring to the celebrated Arabic hero Antar, or Antarah. This refers to Antara who portrays the "Heart of the Scorpion." The hero Antara lived just previous to the time of Muhammad; he died 615 AD at age 90 and was the mulatto warrior-hero of one of the Golden Mu'allakat. Son of an African slave woman and an Arab sheikh, Antara was the bravest warrior of all of the Arabs. As a lowly slave himself he was spurred to greatness by love for his noble cousin Abla. He had his chance when the fortunes of war turned against the tribe. With the enemy closing in on their encampment, his father called him to battle. He followed the call and soon proved himself the most valiant warrior in Arabia. In doing so he held his family to the ancient rule that only a free man with full rights may join in battle. The rule freed him of the taint of slavery and entitled him to marry his beloved. Antara was also known as a great poet, which was great honor in his time, as poets were like today’s newscasters. 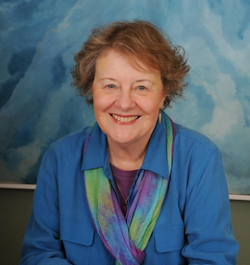 What beautiful messages were given to you then Dr. Sue, and how relevant for us here and now! Thank you, Sue, now I know why I'm eating less and less! Very good.